What is textclipping file? How to open textclipping files? The textclipping file extension is typically related to a special text clipping format used on Apple computers since Mac OS 9. It is still used even in the latest macOS versions. These files are generated when you select and drag selected text on your desktop or in Finder window. If you want to include this text clipping somewhere else, such as a Word document or an email, you simply drag the file from your desktop into the desired target, and your clipped text is automatically inserted. You can probably view these files using any text editor, provided the text data are stil saved somewhere. and possible program actions that can be done with the file: like open textclipping file, edit textclipping file, convert textclipping file, view textclipping file, play textclipping file etc. (if exist software for corresponding action in File-Extensions.org's database). Click on the tab below to simply browse between the application actions, to quickly get a list of recommended software, which is able to perform the specified software action, such as opening, editing or converting textclipping files. Programs supporting the exension textclipping on the main platforms Windows, Mac, Linux or mobile. Click on the link to get more information about listed programs for open textclipping file action. Programs supporting the exension textclipping on the main platforms Windows, Mac, Linux or mobile. Click on the link to get more information about TextEdit for edit textclipping file action. Programs supporting the exension textclipping on the main platforms Windows, Mac, Linux or mobile. Click on the link to get more information about listed programs for view textclipping file action. Programs supporting the exension textclipping on the main platforms Windows, Mac, Linux or mobile. Click on the link to get more information about listed programs for create textclipping file action. Programs supporting the exension textclipping on the main platforms Windows, Mac, Linux or mobile. 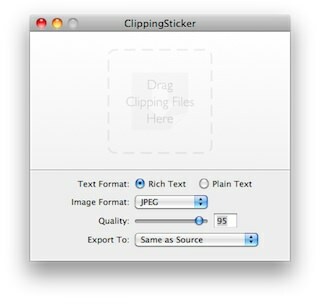 Click on the link to get more information about ClippingSticker for import textclipping file action.